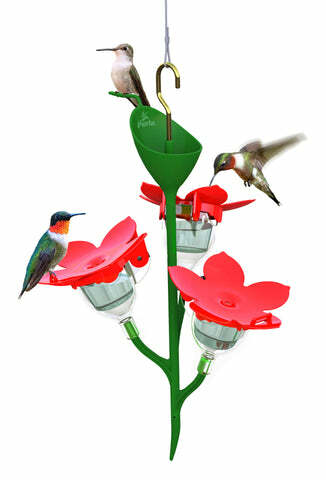 "I am absolutely loving my Allura feeder and so are the neighborhood hummingbirds! Each year, I have several feeders up in my yard -- to encourage visitors & discourage the bullying. The hummingbirds prefer my new Allura feeder to all the others which they ignore to wait (or bully) for a turn at the Allura feeder. I am refilling my feeder 3x everyday this week it's so popular! I've never had as many hummingbird visitors as this year. An added bonus: the design is attractive and super-easy to clean/refill. Thanks for designing such a great hummingbird feeder!! I love it and recommend it to all my friends who share my love of hummingbirds."